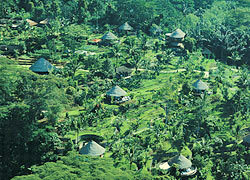 Bali Spa There are only 18 villas in the 5 hectares of a great site where Bagus Jati Spa locates. 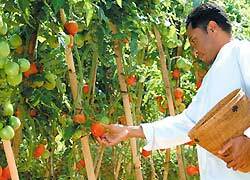 The organic farm and the various Health & Wellbeing facilities, such as a spa center and a yoga pavilion are available in the same site. 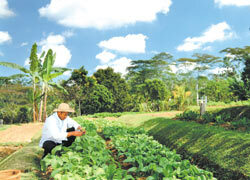 They also farm and use fresh herbs and fruits which are farmed based on the “Jamu” recipe for the treatments. 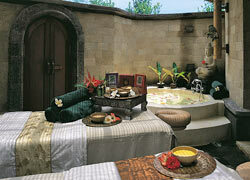 This is a traditional massage which has been introduced into Balinese villages from a long time ago. At first they massage away your muscles without oil to improve blood circulation. The original with a technique of Shiatsu massage will lead you into the deep relaxation. A Javanese massage uses a secret blend of essential oils which is based on a Royal Court recipe using Indonesian spice and flowers. It eases tiredness of nerves and muscles. This is a high quality treatment to revitalize cells of the skin and reset a balance of skin pH. It start with Aroma Oil Massage to make your skin relaxed, they remove body wastes by Body Scrub with Indonesian spice which is chosen for your skin condition. Next, Body Massage of papayas which has a full of protein and Yogurt provides your skin nutrition. Milk Bath with essences of flowers and milk after Head and Facial Massage, makes your skin condition perfect. 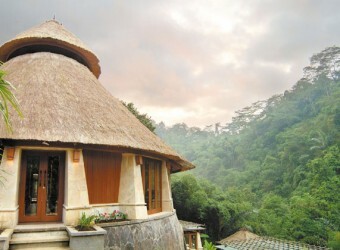 *After treatment, enjoy herbal tea, hot Jacuzzi and steam sauna bath for the last relaxing moment there. It is traditionally used in Bali to warm up a body during monsoon season or at the initial stage of colds, flu, rheumatism or fever. This traditional Balinese spa treatment begins with a deep massage to create a state of deep relaxation. 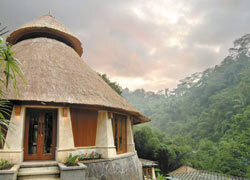 Your body will be warmed up in the bath which rock salt from Madura Island is dissolved. 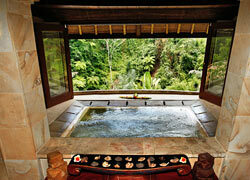 Jacuzzi, Body Mask with Spice mix of the tropical plants and Banana Leaf Wrap will make you being in the heaven. The course starts off with Head and Body Massage and moves on to Body Pack with mud blended with aromatherapy oil which contains high nutrition. While you are experiencing it, Steam Therapy will be done with eucalyptus oil. Hydro Bath with marine salt removes detox from inside of your body. Rain Shower Massage and Body Scrub with mineral salt revitalize cells of your skin. After the facial wash, the therapist focuses on massaging for the spots where cellulites are. Body Mask with pasted thalasso including marine plants, coconuts, bananas and so on, Jet Bath and Strong Shower removes your body wastes. When you complete the treatment, your skin will be revitalized and refreshed. Massaging a body with warm medical oil works well for anti-aging, detoxification and improves blood and nerves circulations. It resets your skin condition and helps taking sleepiness away. The therapist massages a whole body with rice and medical plants oil. Tiredness, it works well especially to cure sleeping problems, high blood pressure and rheumatism. This detoxifying treatment helps to remove body wastes, lose weight and improve levels of energy. 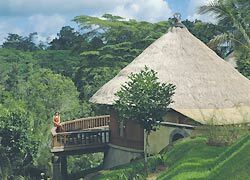 *Free transportation in Ubud area is available. 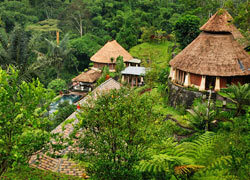 Central Ubud: Free transportation is available by booking more than 2 persons and each person booked 2 hour’s menus. Children can wait in the lobby or the treatment room. There are menus for children over age 8. VISA, MASTER, AMEX, JCB. Please check a commission when you pay. I felt comfortable because the massage therapist with me is a professional massage therapist. Her massage technique is excellent. 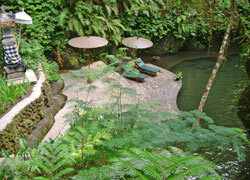 I felt very relax at a tranquil private villa treatment room, and even I didn’t see other guests.